Facebook general counsel Colin Stretch’s week did not improve on Wednesday. Fresh off a hiding Tuesday from Sen. John Kennedy (R-LA), Stretch appeared before the Senate Intelligence Committee, where Sen. Mark Warner (D-VA) read the social media executive the riot act for what he called a refusal to take the problem of foreign interference in elections seriously. “I will have to come back to you on that, senator,” Stretch said. Stretch answered that Facebook had indeed analyzed those posts. “How many Americans did those touch?” Warner asked. Far more than Facebook had initially admitted, it turned out. “The data on Instagram is not as complete, but the data we have indicates that beginning in October of 2016, those Instagram posts reached an additional 16 million people in addition to the 126 million people that we identify,” Stretch said. “Now we’re seeing the Russian activity is roughly at 150 million Americans without knowing how many times they were reshared,” Warner said. Facebook general counsel Colin Stretch admitted to the Senate Intelligence Committee on Wednesday that his company had taken down the account of Chinese dissident Guo Wengui, who lives in the US, on the strength of a report filed to the tech giant by the Chinese government. Guo, a billionaire living in New York City who is a harsh critic of the Chinese government, published on Facebook “sometimes outlandish tales of deep corruption among family members of top Communist Party officials,” the New York Times wrote a month ago, as it reported that Guo’s account had been taken down. Rubio was dubious. “You can testify that you did not come under pressure from the Chinese government or any of its representatives or people working for them to block his account or to block whatever it is you blocked?” he asked. That was Sen. John Kennedy (R-LA) to Facebook general counsel Colin Stretch, in a moment that seemed to stretch out to an hour during Tuesday afternoon’s Senate Judiciary Committee hearing on Russian election interference on social media. Facebook, Twitter and Google all sent their lawyers to answer lawmakers’ questions, but Kennedy, who began his question round by complimenting Stretch’s resume, was prepared. In just a few minutes, he forced Stretch to admit that Facebook had far less insight into its advertisers than it did into each individual user. “Mr. Stretch, how many advertisers does Facebook have?” Kennedy asked sleepily, after thanking the three tech giants for being American companies. “We have approximately 5 million advertisers on a monthly basis, Senator,” Stretch replied. “Did China run ads in the last election cycle? That tried to impact our election?” Kennedy asked. “Not that I’m aware of, senator,” Stretch answered. Kennedy asked about ads from Turkmenistan and from North Korea, each time getting a variation of “I’m not aware” in response. After a little more back-and-forth, Stretch, exasperated, caved. Stretch seemed to sense what was coming. “Senator, we do provide targeted advertising. We don’t actually share the data of individuals with advertisers,” he said. Stretch said Facebook could not know those things, which Kennedy wasn’t buying. “We have designed our systems to prevent exactly that, to protect the privacy of our users,” Stretch replied. Facebook general counsel Colin Stretch on Tuesday offered broad details about the way Russian ads were targeted on the platform, something journalists and citizen groups have been agitating for. Stretch said only a quarter of the ads were specifically geotargeted, however. A Google executive told the Senate Judiciary Committee on Tuesday that the company had discovered two Russian-operated ad accounts that spent $4,700, and also had found 1,100 YouTube videos it suspects were part of Russia’s disinformation campaign. “On YouTube, we found 18 channels with approximately 1,100 videos that were uploaded by individuals who we suspect are associated with this effort, and that contained political content,” Richard Salgado, himself a former Department of Justice official, told the committee. Salgado observed that while YouTube doesn’t offer geotargeting, links to the suspected Russian videos were often posted to platforms that did. He also obliquely referred to “safeguards we had in place in advance of the election” that limited Google’s exposure to the Russian campaign. A Senate Judiciary Committee hearing on the social media portion of Russia’s 2016 election interference opened Tuesday with portentous statements from Sens. Lindsay Graham (R-SC), Sheldon Whitehouse (D-RI) and Dianne Feinstein (D-CA), the latter of whom rattled off some numbers that gave the fullest picture yet of the extent of the disinformation campaign. Reports out Monday said Facebook would tell lawmakers that those advertisements reached approximately 126 million people. The Twitter revelations, however, are far more significant: The platform appears to have identified not just the accounts run directly by Russian trolls working for the IRA (now the Federal News Agency, or FAN), but 37,000 automated accounts that generated information that would promote Russian interests in the American election. Twitter and Facebook representatives opened their statements with apologies and began to detail how they planned to review previous posts and change rules to thwart future disinformation campaigns. Paul Manafort financed a lavish lifestyle with money laundered through offshore accounts, with expenditures including more than $1.3 million in purchases at Beverly Hills and New York clothing stores and more than $1 million on antique rugs, according to a federal indictment unsealed Monday. Manafort pled not guilty. The 12-count indictment against Manafort and his business partner Rick Gates charges that more than $75 million “flowed through” those offshore accounts. It alleges Manafort took $18 million through the accounts, while Gates is accused of transferring $3 million from those accounts to ones he controlled. The bulk of Manafort’s alleged years-long spending spree took the form of $12 million in untaxed money he spent on luxury items and home improvements. 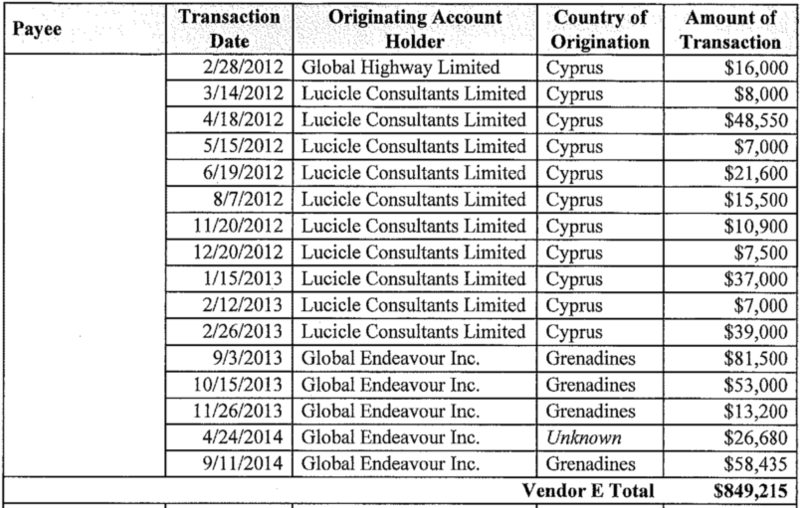 The indictment spells out how Manafort would have one of his 15 offshore accounts—12 in Cyprus, two in St. Vincent and the Grenadines and one in the United Kingdom—wire in cash to each vendor for his purchases. The list of Manafort’s lavish expenditures from his offshore accounts runs across eight of the indictment’s 31 pages. 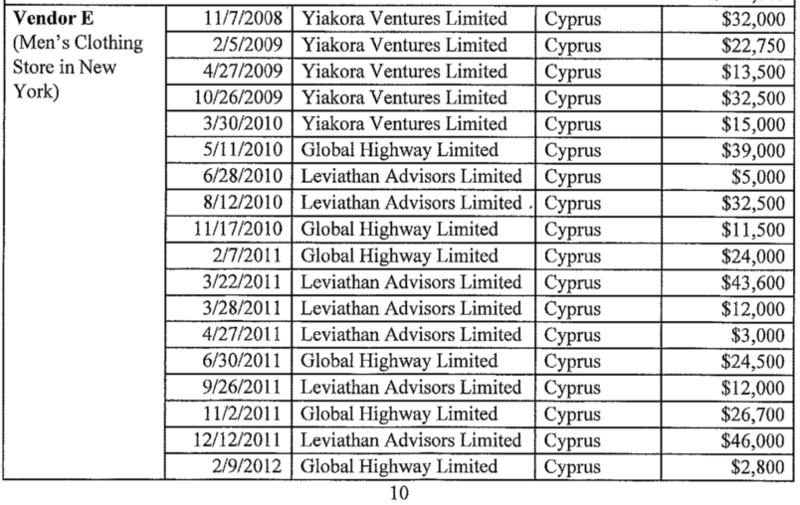 More than $5.4 million went to a “home improvement company” in the Hamptons from a mix of Cypriot entities, notably LOAV Advisors and Yiakora Ventures (An NBC News story about the Manafort’s debts to Russian oligarch and Putin confidant Oleg Deripaska said Manafort’s other companies were a primary influence over Yiakura’s business dealings). Manafort, whose house in Water Mill, New York is among the assets prosecutors have proposed seizing, began spending from offshore accounts at that vendor in 2008 and continued, often several times a month, until August 2014. He also spent quite a bit on lawn care: a Hamptons-based landscaper lists expenditures totaling $164,740. The indictment charges that he wired money to an Alexandria, Virginia rug merchant nine times, from as little as $7,400 to as much as $250,000. Not everyone was willing to chime in, however. A person who answered the phone at Herat Oriental told TPM “no comment” and hung up after a reporter identified himself. Accounts associated with Manafort also made 34 transfers to an unnamed New York clothing store totaling nearly $850,000, and nine transfers to a Beverly Hills clothing store totaling $520,440. He patronized a Florida art gallery in 2011 and again in 2013, where his tab ran to $31,900. A New York housekeeping service also earned $20,000 in three installments from accounts associated with Manafort. Donald Trump’s former campaign chairman Paul Manafort and his business partner Rick Gates were hit with a 12-count indictment unsealed Monday that alleges a wide-ranging money laundering conspiracy and multiple violations of the Foreign Agents Registration Act (FARA). Both will plead not guilty. The charges focus not on collusion between Trump’s presidential campaign and the Russian government but on Manafort’s own alleged money laundering activities, which the indictment says personally netted him $18 million and Gates $3 million. According to the indictment, the money in question came from under-the-table lobbying activities on behalf of Ukraine’s Party of Regions, the party of former president Victor Yanukovych. The two men held offshore accounts that allegedly handled more than $75 million over the nine years covered by the charges. Manafort and Gates were each indicted on one count of conspiracy against the U.S., one count of conspiracy to launder money, one count of acting as an unregistered agent of a foreign principal, one count of making a false and misleading FARA statement and a separate count of making a false statement. Manafort was also indicted on four counts of failure to file reports of foreign bank and financial accounts, while Gates was indicted on three counts of the same. The indictment charges that Manafort “represented falsely that he did not have authority over any foreign bank accounts,” and, in a complicated tax dodge, Manafort “laundered the money through scores of United States and foreign corporations, partnerships and bank accounts,” depriving the U.S. of tax revenue, according to the indictment. It also alleges that Manafort, who was not registered as a foreign agent, took steps to “develop a false and misleading cover story” that would conceal his work for the Party of Regions in order to distance himself from the Government of Ukraine. In the indictment, the government proposes seizing four of Manafort’s real estate properties—three in New York and one in Arlington, Virginia—as well as his life insurance policy. Wading into the debate over the effect of Russian meddling on the 2016 election, on Thursday Deputy Attorney General Rosenstein played down the impact of Russian-backed ads posted on various online platforms. No assessment of Russian interference in the election has attempted to measure whether or not that interference was effective, but all of them concurred that it happened. The extent of the Russia-backed ads, intended to sow division during the election, on major platforms like Facebook and Twitter has only become publicly known in recent weeks. Rosenstein, in his role as acting attorney general for the Russia investigation, appointed Robert Mueller as special counsel and is overseeing Mueller’s probe. Attorney General Jeff Sessions had previously recused himself from matters relating to Russian interference. Rosenstein referred the matter to the intelligence agencies when asked what kinds of consequences the Department of Justice could mete out to the Russian government for meddling in the 2016 election. Target USA’s network, PodcastOne, distributed Rosenstein’s full quote playing down Russian attempted election tampering. On a separate topic, Rosenstein was more certain about his views on the role whistleblowers: Setting aside legal considerations, “any responsible person” has “a moral obligation not to disclose things if it’s going to cause harm,” he said.